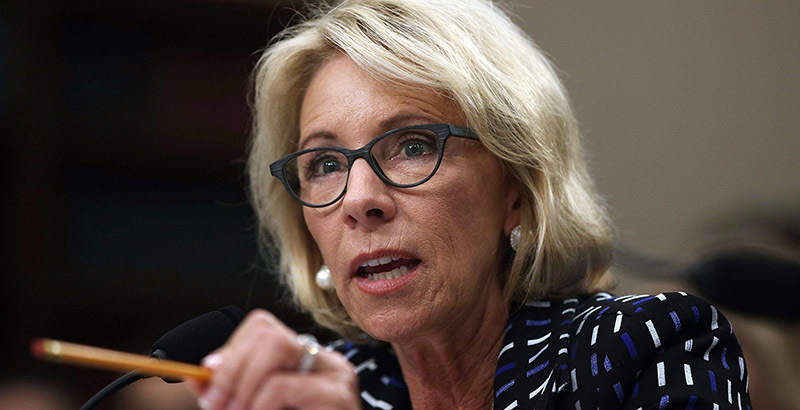 The expansion of 529 savings plans to cover K-12 education expenses is a good first step to expanding school choice — but just that, Education Secretary Betsy DeVos said Tuesday. “Anything that empowers parents and gives them more opportunities is a good thing, but it doesn’t address the needs of parents who are from lower incomes and does not empower them in significant ways. That has to continue to be an important consideration on our radar screen,” DeVos told reporters. The bill would allow families to save up to $10,000 per year in tax-advantaged accounts for tuition at private K-12 schools or homeschooling expenses as they can now for college costs. Advocates have said it won’t help low-income families who can’t afford to save the money up front. The tax bill was on track to pass both chambers of Congress Tuesday evening, until the Senate parliamentarian declared that three provisions, including allowing families to use 529 plans for homeschool expenses, violate a Senate rule banning the consideration of “extraneous matters” in bills considered under the fast-track rules being used for the tax measure. It now must go back to the House for another vote Wednesday, without the problematic provisions, before returning to the Senate. DeVos took a few questions from the education press, an uncommon occurrence during her contentious first year, after a “Rethink K-12 Education” summit held at the Education Department’s headquarters in southwest Washington, D.C. Asked about the GOP bill’s $10,000-a-year limit on state and local tax deductions — a move advocates say could imperil K-12 school funding — DeVos declined to offer any specifics but said there are examples of districts innovating with little money. One of the school districts highlighted during Tuesday’s event, Mooresville Unified in North Carolina, does just that. Superintendent Stephen Mauney told DeVos and the other 20 or so participants about his district’s stellar results, driven by a 1:1 laptop program, despite spending just $7,500 per student per year. That put the district at No. 100 out of 115 in per pupil spending in the state, he said. Tuesday’s “Rethink K-12 Education” event followed the secretary’s September “Rethink School” tour, which took her to six states, and a similar “Rethink Higher Education” event held in D.C. last week. This week’s gathering included three panels, with leaders of innovative school districts, charter schools, and private schools and a representative of homeschoolers. Though she’s best known for her school choice advocacy — and she pledged to continue it after the small 529 expansion win — the K-12 event was not about school choice, she emphasized to reporters after the meeting. “This is not a conversation about school choice. It’s a conversation about doing what’s right for individual students,” she said, emphasizing the variety of innovative schools featured. Discussion following each session touched on how school leaders can work together to better advance new opportunities, and how government leaders can aid in that innovation work — or at least get out of the way. True innovation will take a wholesale redesign of the teaching profession, said Diane Tavenner, CEO and founder of Summit Public Schools, a charter group in California and Washington state that focuses on small schools and personalized learning. “I think that we should really invest heavily in figuring out that role and making it a stable role that enables success. 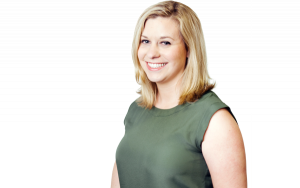 It’s going to require significantly more,” she said, adding that even the teachers her organization trains fall short of that truly redesigned idea. Several other school leaders brought up the importance of teacher training and professional development and the federal Title II funds that support it. The Trump administration proposed eliminating those funds, currently about $2 billion, in its fiscal 2018 budget. House Republicans also ended the grants in their spending bill. The Education Department, like the rest of the federal government, has since September been running on continuing resolutions that keep programs going as is. The current funding bill expires Friday. When asked about the disparity between the panelists’ emphasis on teacher training and her own moves to cut Title II, DeVos said her department has worked to emphasize flexibility in spending federal dollars. “The flexibility to be able to prioritize the kinds of training and professional development that was referenced here today continues to be a really important priority,” she said. In terms of pushing for innovation generally or any one policy specifically, DeVos, as she has in the past, cast herself in a limited role, saying there’s little she should be doing beyond highlighting innovative school models and encouraging states to do their part. “Decisions are best made closest to the students … While there are certain policy levers, they are a distant second to the encouragement we can give to states to really pick up this mantle in a major way,” she added. She also again encouraged state leaders to be innovative in their plans to implement the Every Student Succeeds Act, she said, echoing comments she made last month. Democrats and civil rights advocates have said DeVos’s Education Department has taken too light a hand, approving plans that don’t protect vulnerable students.